Something always goes wrong. Yesterday the board booted fine on my desk, but when I put it in the case it was stuck in a reboot loop. Somehow the BIOS became corrupt; thankfully this thing has two and I was able to reboot and reflash. Hours of painstaking rebuilding and installation followed, rebooting after every single change to make sure it wasn’t going to blow up again. When it would boot, Windows wouldn’t start, saying something about an NTFS error. One of the bays in that 2.5" dock isn’t working. It’s probably just a loose or disconnected SATA cable. Hopefully. At least the other three are working just fine. One of the hard drives isn’t being recognized. Probably another loose cable. The SATA cables I have are either too long or too short, with too many having 90 degree connectors, with most of those facing the wrong way. Things don’t fit. The cooler is too big for the case (and has stupid red LEDs; the plain one was $3 more and I’m a cheapskate, so stupid red LEDs it is...) so the side panel is ajar. The 1000W power supply took up too much space leaving little room between the PS cables and the devices in the 5.25" bays. The cable for the media reader is too short, so that can’t be connected, at least not until the USB header splitter/multiplier thingy arrives, but the new USB2/USB3/media reader will have arrived by then making this point moot. I’m out of internal SATA ports, even with a SATA III/USB 3.0 combo card; if I want it connected it’ll have to be via eSATA. 8 out of 8 in use. Some of the fan cables can’t reach the motherboard and will probably require extensions, things I may have to make from scratch. I didn’t get the full complement of cables for the modular power supply (I downgraded from the 1000W unit to one with only 850W), so extra devices need to run off of splitters. There seemingly isn’t any standards on modular PS cables, even from the same manufacturer. Windows is no longer activated. When I tried to use the key that showed up in Speccy it said that it wasn’t valid. How do I retrieve the correct key? 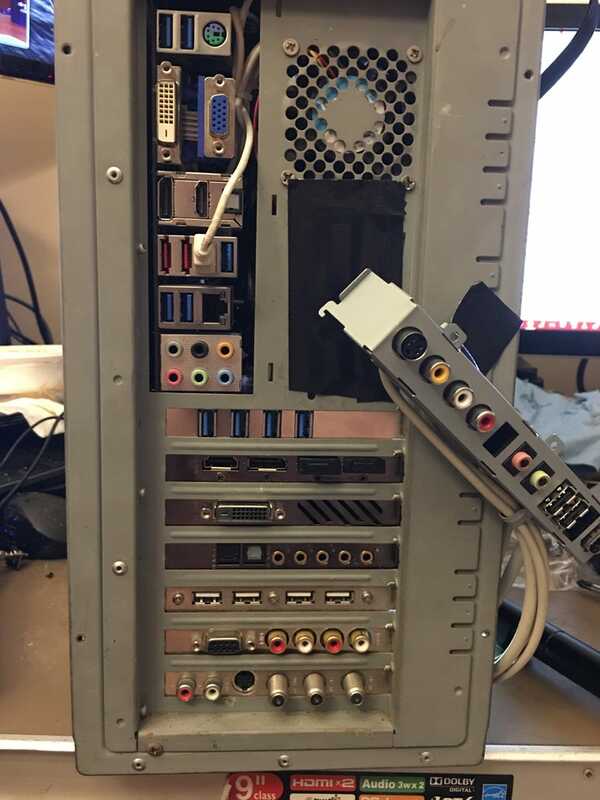 There aren’t enough empty slots on the back of the case when the PCI and PCIe slots are in use, so no extra headers or anything other than those four USB 2.0 ports currently blocking the last PCIe port. Nobody seems to make a case with five or more 5.25" bays so I’m left to scour CL for something that will fit all these bits and pieces. The two USB ports by the PS/2 ports didn’t seem to work earlier. I’ll have to try them again as something Intel and USB wasn’t working earlier according to device manager but wasn’t a problem later. This case is too tall to easily slip under the desk, so I’ll have to place it elsewhere or lift the desk to get it underneath.